Astronomers have discovered strange and unexpected behaviour around the supermassive black hole at the heart of the galaxy NGC 5548. The international team of researchers detected a clumpy gas stream flowing quickly outwards and blocking 90 percent of the X-rays emitted by the black hole. This activity could provide insights into how supermassive black holes interact with their host galaxies. The discovery of the unusual behaviour in NGC 5548 is the result of an intensive observing campaign using major ESA and NASA space observatories, including the NASA/ESA Hubble Space Telescope . In 2013 and 2014 the international team carried out the most extensive monitoring campaign of an active galaxy  ever conducted. There are other galaxies that show gas streams near a black hole, but this is the first time that a stream like this has been seen to move into the line of sight. 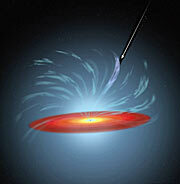 As matter spirals down into a black hole it forms a flat disc, known as an accretion disc. The disc is heated so much that it emits X-rays, near to the black hole, and less energetic ultraviolet radiation further out. The ultraviolet radiation can create winds strong enough to blow gas away from the black hole, which otherwise would have fallen into it. But, the winds only come into existence if their starting point is shielded from X-rays. 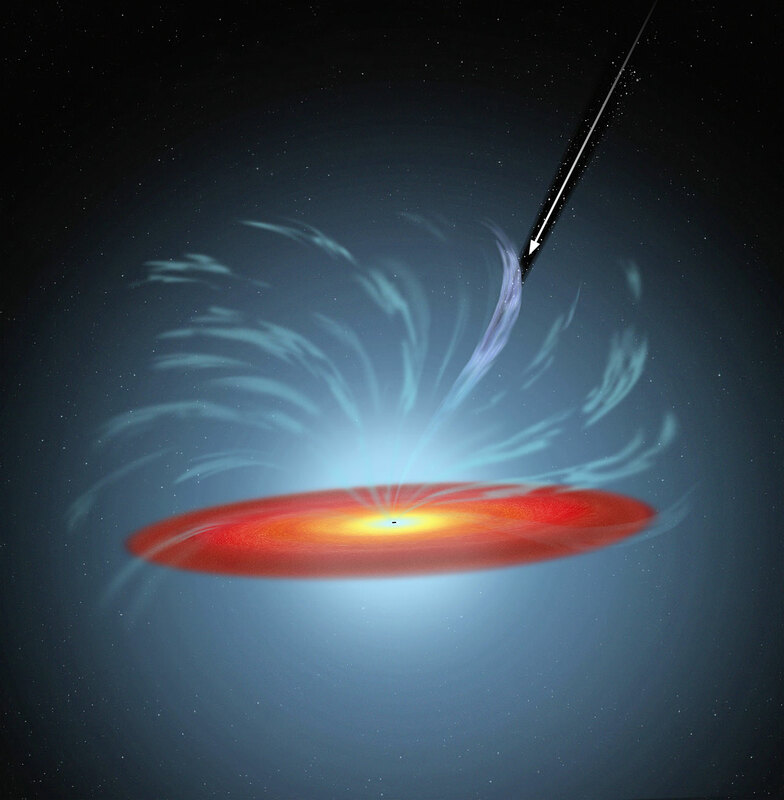 Earlier observations had seen the effects of both X-rays and ultraviolet radiation on a region of warm gas for away from the black hole, but these most recent observations have shown the presence of a new gas stream between the disc and the original cloud. The newly discovered gas stream in the archetypal Seyfert galaxy NGC 5548 — one of the best-studied sources of this type over the past half-century — absorbs most of the X-ray radiation before it reaches the original cloud, shielding it from X-rays and leaving only the ultraviolet radiation. The same stream shields gas closer to the accretion disc. This makes the strong winds possible, and it appears that the shielding has been going on for at least three years. Directly after Hubble had observed NGC 5548 on 22 June 2013, the team discovered unexpected features in the data. “There were dramatic changes since the last observation with Hubble in 2011. We saw signatures of much colder gas than was present before, indicating that the wind had cooled down, due to a strong decrease in the ionising X-ray radiation from the nucleus,” said team member Gerard Kriss of the Space Telescope Science Institute in Baltimore, USA. After combining and analysing data from the six observatories involved, the team was able to put the pieces of the puzzle together. 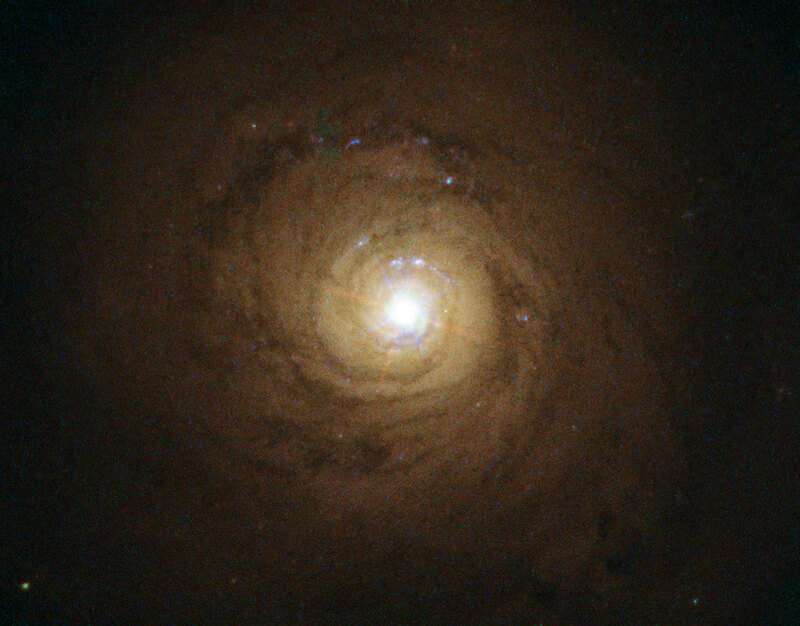 NGC 5548’s persistent wind, which has been known about for two decades, reaches velocities exceeding 3.5 million kilometres per hour. But, a new wind has arisen which is much stronger and faster than the persistent wind. Strong X-ray absorption by ionised gas has been seen in several other sources, and it has been attributed for instance to passing clouds. “However, in our case, thanks to the combined XMM-Newton and Hubble data, we know this is a fast stream of outflowing gas very close to the nucleus,” said team member Massimo Cappi, of INAF-IASF Bologna. “It may even originate from the accretion disc,” added team member Pierre-Olivier Petrucci, of CNRS, IPAG Grenoble. These results are being published online in the 19 June issue of Science Express. The observatories include ESA’s X-ray Multi-Mirror Mission (XMM-Newton), the NASA/ESA Hubble Space Telescope, NASA’s Swift, NASA’s Nuclear Spectroscopic Telescope Array (NuSTAR), NASA’s Chandra X-ray Observatory, and ESA's International Gamma-Ray Astrophysics Laboratory (INTEGRAL). An active galaxy is a galaxy which hosts an active galactic nucleus (AGN). An AGN is a compact region at the centre of a galaxy that has a much higher than normal luminosity. The high level of radiation, sometimes across the whole of the electromagnetic spectrum, is thought to be a result the supermassive black hole at the centre pulling in mass from the surroundings. The interactions between black holes and their host galaxies are believed to have a fundamental importance on the way galaxies evolve. ESA/Hubble and NASA. Acknowledgement: Davide de Martin.